David Fredone Melik·Beglar was the son of the last independent Armenian ·Prince of Karabagh in Eastern Armenian. This province passed under Persian rule in 1620 as a result of a treaty between the Turks and Shah Abbas. As the people of this province were all Armenians, the Persian King wisely handed over its government to five semi-independent Armenian princes, namely, the Meliks, who ruled over Karabagh until the commencement of the 19th century when it was annexed by Russia. D. F. Melik Beglar came to India in 1813 as “a deacon and chorister to the Archbishop Phillipos”, an envoy from Echmiatzin (the Mother Church of the Armenians.) He lived for some time in Dacca. His first wife, Nazloom died there in 1836 and is buried in the grounds of the Armenian Church. He remarried to Khatchkhatun in Dacca and had a further five children. He and Khatchkhatun settled in Chinsurah where he died in 1884 at the age of eighty-nine and was buried in St. John’s Churchyard. His wife died there in 1893 and was laid to rest close to him. 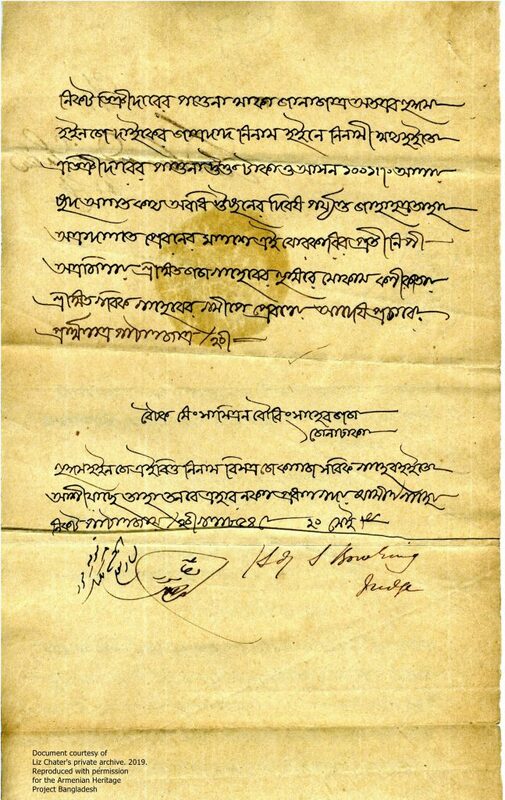 During his time in Dacca David Melik Freedone Beglar sued Arratoon Harrapiet Arrathoon in 1849 for Rupees 1947-8-4-6. Beglar is chasing the money from the sale of effects of Arratoon which were in turn being sold to satisfy the action Aratoon’s estranged wife took against him in 1845 in which she had cited ill-treatment. She was trying to recover her own substantial real and personal estate which he had been guardian over when they married as she was under age at the time in 1836. However Arratoon’s wife, Catherine is rather unfairly having to pay her estranged husband’s debt due to David Melik Freedone Beglar, through no fault of her own. These rare images of the court papers give a glimpse into this period of Beglar’s life. 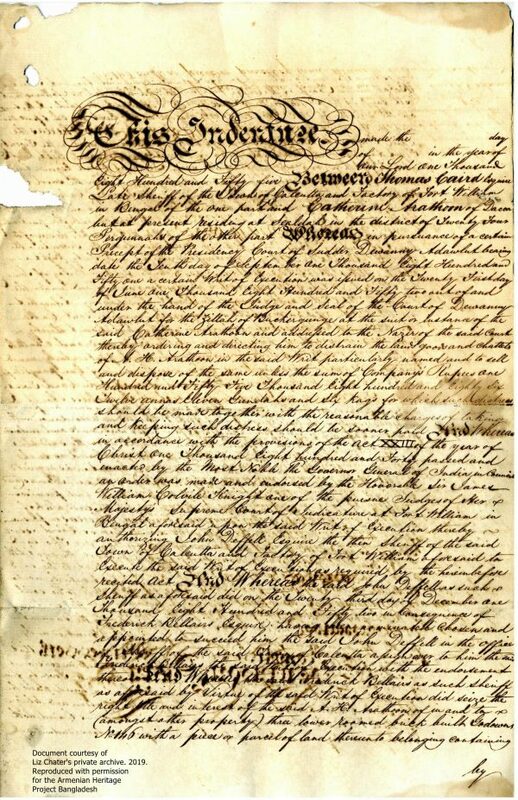 This indenture made the blank date of blank in the year of our Lord one thousand eight hundred and fifty five BETWEEN Thomas Caird Esquire late sheriff of the town of Calcutta and Factory of Fort William in Bengal of the one part and Catherine Arathoon of Dacca but at present residing at Sealdah in the district of twenty four Pergunnahs of the other part WHEREAS in pursuance of a certain receipt of the Presidency Court of Sudder Dewanny Adawlut bearing date the tenth day of September one thousand eight hundred and fifty one a certain write of execution was issued on the twenty first day of June one thousand eight hundred and fifty two and of and under the hand of the Judge and Seal of the Court of Dewanny Adawlut for the Zillah of backergunge at the suit of instance of the said Catherine Arathoon and addressed to the Nazir of the said Court thereby ordering the directing him to distrain the lands goods and chattels of A.H. Arathoon in the said write particularly named and to sell and dispose of the same unless the sum of Company’s rupees one hundred and fifty five thousand eight hundred and eighty six twelve annas eleven Gundahs and six Kags for which such distress should be made together with the reasonable charges of taking and keeping such distress should be sooner paid AND WHEREAS in accordance with the provisions of the Act XXIII of the year of Christ one thousand eight hundred and forty passed and enacted by the most noble the Governor General of India in Benares an order was made and endorsed by the Honorable Sir James William Covile Knight and one of the pusine Judges of Her Majesty’s Supreme Court of Judicature at Fort William in Bengal aforesaid upon the said writ of execution thereby authorizing John Deffell Esquire the then Sheriff of the said town of Calcutta and Factory of Fort William aforesaid to execute the said write of execution as required by the hereinbefore recited act. AND WHEREAS the said John Deffell as such Sheriff as aforesaid did on the twenty third day of December one thousand eight hundred and fifty two in consequence of Frederick Bellairs Esquire having then no minated??? 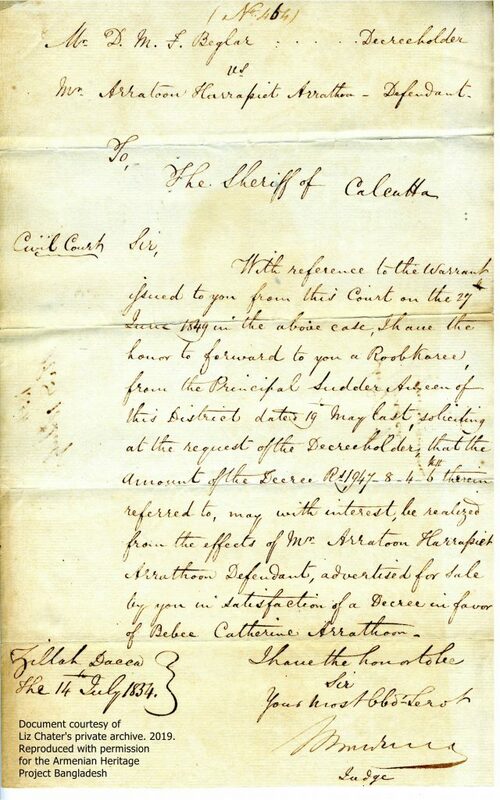 chosen and appointed to succeed him the said John Deffell in the office of Sheriff of the said town of Calcutta assigned over to him the said Frederick Bellairs the said writ of execution with the endorsement thereon AND WHEREAS the said Frederick Bellairs as such sheriff as aforesaid by virtue of the said writ of execution did seize the right title and interest of the said A.H. Arathoon of in and to (amongst other property) three lower roomed brick built godowns No. 146 with a piece of parcel of land therein to belonging containing by estimation one Cottah more or less situate lying and being at T—tys Bazar in the town of Calcutta and butted and bounded as follows (that is to say) on the south by a house of the defendant the said A.H. Arathoon on the north by the house of Mr. Perira on the east by Chitpore Road and on the west by ???? of the said defendant AND WHEREAS the said Frederick Bellairs as such sheriff as aforesaid did on the twenty first day of December in the year of Christ one thousand eight hundred and fifty three in consequence of the said Thomas Caird Esquire ???? been no ???? chosen and appointed to succeed him the said [Frederick] Bellairs Esquire in the offices of Sheriff of the town of Calcutta ???? over the said Thomas Caird the said write of execution together with the said godowns lands and premises No. 146 hereinbefore particularly mentioned AND WHEREAS in pursuance of a certain other decree of the Court of Sudder Dewanny Adawlut bearing date the seventeenth day of August one thousand eight hundred and forty eight certain other writ of execution was issued on the sixteenth day of January one thousand eight hundred and fifty four out of and under the hand of the Judge and Seal of the Court of Dewanny Adawlut for the Zillah aforesaid at the suit of instance of the said Catherine Arathoon and addressed to the Nazir of the said Court thereby ordering and directing him to distrain the lands goods and chattels of the said A.H. Arathoon in the said writ particularly named and to sell and dispose of the same unless the sum of Company’s Rupees one hundred and seventy two thousand five hundred and twenty seven ten annas and six pie for which such distress should be made together with the reasonable charges of taking and keeping such distress should be sooner paid AND WHEREAS in accordance with provisions of the hereinbefore recited act an order was made and endorsed by the said Sir James William Colvile Knight upon the said writ of execution thereby authorising the said Thomas Caird as such sheriff as aforesaid to execute the said writ of execution as required by the hereinbefore recited act AND WHEREAS the said Thomas Caird Sheriff as aforesaid did seize the said godown land and premises No. 146 hereinbefore particularly mentioned under the said writ of execution as directed to him as aforesaid AND WHEREAS in pursuance of the two several writs of execution the said Thomas Caird as such sheriff as aforesaid did on the eleventh day of May one thousand eight hundred and fifty four put up and expose the right title and interest of the said A.H. Arathoon of in and to the said godowns land and premise No. 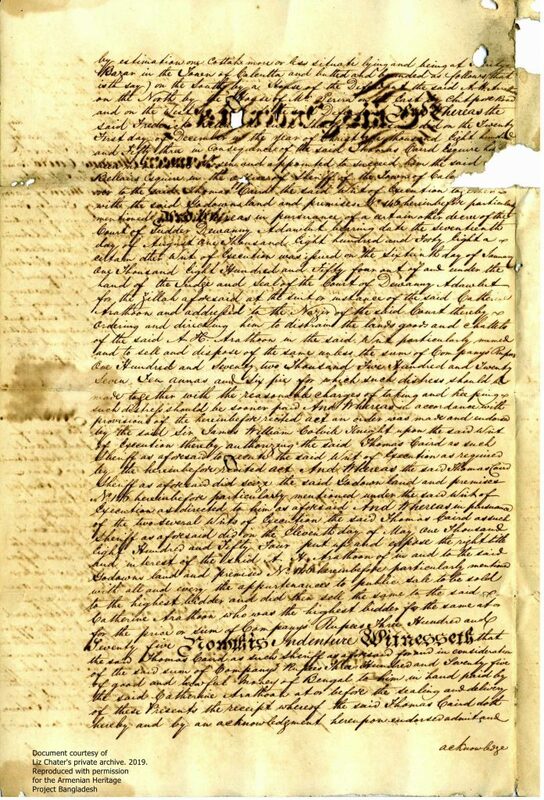 146 hereinbefore particularly mentioned with all and every the appurtenances to public sale to be sold to the highest bidder and did then sell the same to the said Catherine Arathoon who was the highest bidder for the same at or for the price or sum of Company’s Rupees three hundred and twenty five NOW THIS Indenture WITNESSETH that the said Thomas Caird as such sheriff as aforesaid for and in consideration of the said sum of Company’s Rupees three hundred and seventy five of good and lawful money of Bengal to him in hand paid by the said Catherine Arathoon at or before the sealing and delivery of these presents the receipt whereof the said Thomas Caird doth hereby and by an acknowledgement hereupon endorsed admit and acknowledge he the said Thomas Caird by these presents doth (as much as in him lies and he can or legally may do so) bargain sell assign release transfer set over and convey until the said Catherine Arathoon her heirs executors administrators and assigns the right title and interest of the said A.H. Arathoon of in and to all those brick built godowns together with the said piece or parcel of land ground No. 146 situate lying and being at Tereetys Bazar in the town of Calcutta hereinbefore particularly mentioned TO HAVE AND TO HOLD the right title and interest of the ????? A.H. Arathoon of in and to the said land and godowns No. 146 hereinbefore particularly mentioned and every part and parcel thereof with all and every the appurtenances unto and to the use of the said Catherine Arathoon her heirs executors administrators and assigns according to the nature thereof for ever. IN WITNESS whereof the said Thomas Caird as such sheriff as aforesaid hath hereunto set his hand and seal of office the day and year first above written. 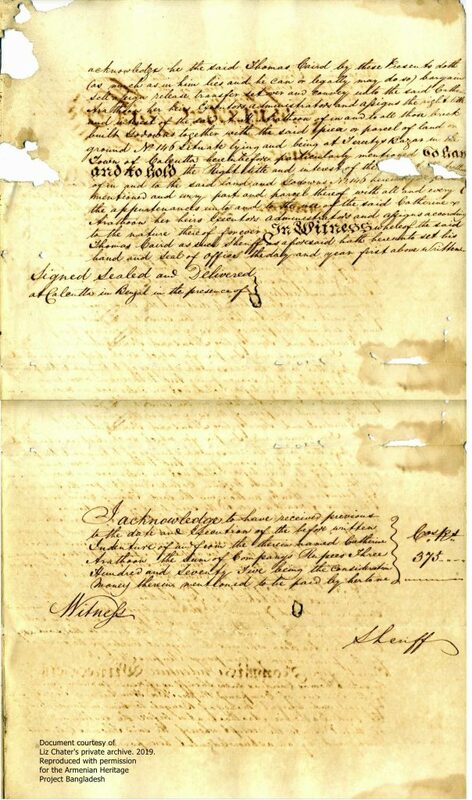 I acknowledge to have received previous to the date and execution of the before written Indenture of and from the therein named Catherine Arathoon the sum of Company’s Rupees three hundred and seventy five being the consideration money therein mentioned to be paid by her to me.